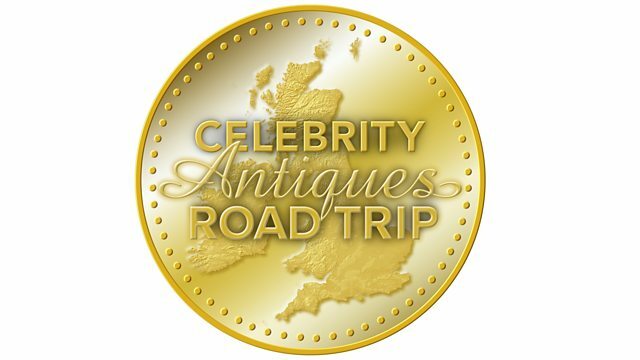 Celebrities hunt for antiques across the UK. Gloria Hunniford and Angela Rippon battle it out in Kent and Sussex with the help of experts Paul Laidlaw and David Harper. Browse content similar to Angela Rippon and Gloria Hunniford. Check below for episodes and series from the same categories and more! Ooh, go on, have a stroke. -No, this is a Herbie! -This is a Herbie, darling. This is a Volkswagen Beetle! The bottom line is, I do not like gears. See, I see no point in a geared car. much more control over the car than you have with an automatic. are Gloria Hunniford and Angela Rippon. We're like Thelma and Louise in this, aren't we? We are. We might never come back off this programme. trying their hand at everything from antiques to ballroom dancing. -Thank you, Darren and Gloria. and she used to present Top Gear. that the rumpus really started. I know, I know, I keep doing that instinctively, don't I? are regularly to be found writing wrongs on Rip-Off Britain. have mixed feelings about working with consumer champions. We've got two icons, haven't we, today? -Mind you, I can't help but feel we're being infiltrated. Well, this thing that they do - Rip-Off Britain. -"The sordid underbelly of the antiques world..."
"We picked up on this pair of likely lads." "Look at the way they negotiate!" or at least that's the plan. Standby! Get out and get under then, chaps. You'll want somebody obviously at the helm, as it were. Crikey, our jalopies usually last a bit longer than this! -Oh, it's a steam engine?! Go, baby! Yeah, you can do it, come on! DAVID LAUGHS It's got nothing! Oh, hang on! Rescue could be at hand. -I am very good. I bet you're glad to see us. -Really lovely to see you. What d'you reckon, do we give them a lift? DAVID: Really? GLORIA: Very well turned out. DAVID: Never been told that before! Gloria, I think we've scored, darling. Get in the back! So, the celebrities get them out of there. before making for the capital and an auction at Chiswick. GLORIA: I would say this is rather cosy in the back, wouldn't you? DAVID: We're getting very cosy here, aren't we? -Well, don't get too cosy! Not with my expert! THEY LAUGH DAVID: Are we together, Angela? I think we are, yes. GLORIA: Ah! Well, I guess we're together then? -Well, you know, I like big, handsome men. And you ended up with me, unfortunately! sits within Britain's newest national park. Ah, now, there's an encouraging sign. Angela and David are the first to squeeze from the Beetle into a shop. -Hello, Michelle. David, nice to see you. -This looks very exciting, can we dive in? -We'll shout you when we want a deal doing. set about doing a little bonding. cos it's so beautifully made. that had tongue and groove on the doors? You know what? This is my kind of woman, this is perfect! she's almost an expert herself. It's probably Indian, from the days of the Raj. -Oh, don't be silly, it's modern. -No, don't think so. Let's have a look. -I don't think that's terribly old. -I bet you that's not very old. No, I think you're actually probably quite right. I think we already know who's in charge here, don't we? -Please can I handle that? -Isn't that lovely? Look at that. How much is this? Ah, £215?! -You know, actually, that's not that bad. It's not bad. Is it actually a Liberty piece? -Turn it over on the other side. -It is, it's a Liberty & Co.
-There may have been a pair. -Definitely would have been a pair. It wouldn't have been one on its own. Is it marked Tudric on the base? -There you go. OK, let me have a look at the number. So, Tudric is a design purely made for Liberty. Save your breath, David, Angela already knows. -I would guess that's First World War-ish. but look at the shapes, oh! There's no profit to be had, however, nice though it is. I would have that in my home. -Oh, go on, have a stroke. -I'm just going to hold on to it. -That's like a teddy bear. This is all very well, you two, but what are you actually going to buy? You see, this is very cool and trendy now, look at that nest of tables. -Very G Plan that, isn't it? Oh, it is G Plan! There we are, it's vintage G Plan. It's bang on trend - 1970s. G Plan sticker's still on the bottom. -But what's nice about this, Angela, it's well-made. -it was made to last for a very long time. and cleverly branded as G Plan. So we've got to bear that in mind, haven't we? Sounds like Chiswick might have that little nest coming its way. What about Gloria and Paul, bit more room in the Beetle now? When I was very young, my mum, you know, she would haggle on everything. She would say, "Is that the best you can do? "Could you not take a bit off for that?" And I used to be so embarrassed I had to walk away. and so it sort of goes on. Those two could make a formidable team, you know. -Gypsy caravan on the right-hand side. -Hello. Hi, how are you? -Hello there, how are you doing? No, we're just loving the caravans, gorgeous. It looks like you live in an idyll there! -How long will you stay in this spot? pulling their set with the horses. And they are doing two shows on Romney Marsh. How long will it take you to get from here to Romney Marsh? -To get to that part of Kent would be a week, wouldn't it? What a wonderful way though to amble along the road at your own leisure. It's lovely when you can stop in a spot like this. their rivals are having their first difference of opinion. Stand-by. -Oh, it's a jolly nice ginger jar that, isn't it? -I love Poole, but for me, that's just too traditional. I think he's got a point, Angela. It's beautifully made, there's not a mark on it. -Can I pop it with the G Plan thingies? Cos I think that's rather nice there. -So what have we got so far? We've got 75 and 35. Angela gets her way, of course. What else is there then? -Oh, look at that for the bathroom! -There is a market for that. -Needs a bit of a clean. Does a bit, it's held a lot of wet, damp towels in its time. I mean, that would come off, wouldn't it? -But look at its shape, Angela. -Look at that shape. Is that nice? -It's very 1950s, isn't it? -You're right, I think this is second generation Art Deco. kicks off again after the war when they're reinventing the style. Shall we put that with the table and the pot? -Well, I think we're going in the right direction. -What is it, 18 quid? Am I allowed to clean that up beforehand? I think we could sneak it, give it a bath. I'd like to clean that up cos that could be quite nice. OK, put that aside as well, then. -We're going very 20th century, aren't we? That's right. It's all of at least 14 years old! Now for a chat with Michelle. -So, we've got the nest of G Plan tables. And we've got the Poole Pottery ginger jar, right? What is your best price on that and that? and 33 on the ginger jar. Oh, I'm not interested in that, I had a much lower price than that in mind. That would be the normal trade price. -I'm not interested in normal trade! -No, you're not, are you?! -Not even going to think about that. -Ooh, now, be careful here. 75... You gave in too easily! Yes, it sounds like you could have pitched a little lower, Angela. -I think we've got a chance, I do. -25 for that or should...20 for that? -You can't do 20? All right, 25 then. All right, 75 for the two. OK, so I think, basically, you've done a deal. OK, now, Michelle, you're really, really going to have to help us out on this. What's your best price on that? -How much is on it? -I could probably do 15. -That's what I thought you were going to say. She means business. Good luck, Michelle. And then that makes it a nice round 85 for the three things. So, what's it like trying to keep up with the indomitable Angela Rippon? She knows exactly what she wants, goes for it, and he gets it. There is no mucking about. ..on the edge of the Ashdown Forest at Nutley. And where's yours, Maureen, what do you specialise in? I just have a mix of everything. That is EXACTLY what they'd like to hear, I'm sure, Maureen. and Gloria knows a thing or two about antiques. Am I right in saying that this is a majolica? -Indeed, we could go with that. but more importantly, it wants to be nicer than that and fine. Is it like cabbage leaves? I don't know, but the glazes aren't particularly finely applied. -This isn't the majolica we were looking for, sadly. That's what he's here for, keep looking. A pair of lampposts, perhaps? -So they're just reproduction ones, are they? We haven't got the money anyway! Can Paul come up with anything better though? that caused me to ask to see it. -"From the decking of the Mauretania..."
"..the Old Lady of the Atlantic." the teak from the decks was turned into little collectables. My problem is, one - they're never that valuable. Two - it's not in the best of condition, is it? but Paul's also spotted a Wemyss pot. The colours are lovely, aren't they? -are the pigs with the big cabbage roses on? Yes, by Karl Nekola, that's what we recognise as Wemyss. -Identified with the Queen Mum? -..to bring you an audience. I thought that halo was above your head! Let me just have a look at it. Now, do you see any cracks or chips which would be fatal? -If it's got a crack, you'll get a real resonance. things like that, but that would be an awful waste, wouldn't it? -but what would it need if it were for jam? possibly even with a little aperture for your preserve spoon. -Right, what price is on that one? -It is priced up at £65. I wonder what Maureen makes of the lid question? Well, it hasn't got any damage round there though, has it? -there would be a bit of damage here? -I think there might have been, yes. -Is there a margin in there that you could erode to our benefit? -Still a bit too high, isn't it? For our purposes, I don't think it's a trade purchase. -Right, I think we can go for 40. -Could we settle on 35? -Let's stick at 40 at the moment. Oh, she's good, she's good, she's good! D'oh! We've met our match! We're thinking 35, we are hoping that maybe you'll meet us there? -Could we do 13 each? -I'll give you three quid. Yeah, why would we quibble over a few pounds? We're not that hard! -Have we just done a deal? thank you for meeting us in the middle there. You're not getting your two quid back. Hell, yes, I'm getting my £2 back! I would wrestle for £2. Phew, that was a titanic struggle! Now, where are Angela and David? taking inspiration from the Sussex countryside and the South Downs. -Hi, I'm Vicky, nice to meet you. -Hi, Vicky, I'm David. Nice to see you. Look at it, it's so stunning! followed a few years later by the writer and her husband, Leonard. and her partner Duncan Grant. In London, she was very much part of the Bloomsbury set, wasn't she? -With lots of very famous friends. Did they come here and if so, who used to come into this room? -They're big names, aren't they? -They sat in these chairs? there are photographs of the likes of TS Eliot and EM Forster. -Wouldn't you love to have been a fly on the wall and listened to the conversations? Sometimes, don't you just wish you could go back...? -If these beams could talk! which served as both writing room and bedroom. Oh, what a pretty little room. Where would she have written in here? She would have put a board across the arms of that. -She would have written on her lap. Well, she was quite keen to write things by hand. make sure the rhythm was right and she'd do that in the bath. What are those books with the bindings on the back? and one of them was covering books. -And what are they actually covered in? -It is actually marbled paper. or something she purchased, but she was really keen on marbled paper. on there as well and hand written on them. So it's the only manuscript we have of hers in the house. in the fireplace with tiles painted by her sister. much of that book written in Virginia's garden hideaway. -Well, she had a lovely walk to work every day, didn't she? -Sun shining like today, you can't moan, can you? Leonard had a saying for it, didn't he? and then she would go back in for lunch. get some more inspiration, come back, work on her writings. -So these are her glasses? -They are her glasses, yeah. a desk to write, it just used to be somewhere to store papers. were very fond of a game of bowls. And at Monk's House, you can get on the green yourself. There's the jack... Well, we have to put the jack out first, don't we? Oh, I can't believe it, she's knocked you further forward! Oh, I do like a happy ending. You are in the right place for girl power. Yeah, that's true, that's true. It's today's theme, all right. Night-night, then. -because you don't have a great track record with old cars, do you? How very dare you, Harper! doesn't get a mile before the car gives up the ghost! because Gloria and Paul managed just one pot for £38. D'oh! We've met our match. Leaving Gloria feeling more than a tad frustrated. -Where are your negotiating skills? -GLORIA: Well, we didn't have anything to negotiate. -But you got to sharpen them up. It's all very well, if you've got something that you're haggling over. Give it a bit of a clean and that could be quite nice. ..leaving them with just over £300 to spend today. because we went into a shop that was an absolute Aladdin's cave. -"At least if we don't spend anything, we haven't lost anything." Don't worry, Gloria, you'll be fine. We're in the same first shop. It could be handbags at dawn, can you imagine? -fighting to get in the door first. but our next stop is the Kent village of Otford. but as you can, things have calmed down quite a bit since then. Leafy place, very nice indeed. -They've got a new car today. Well, the Healey has already gone further than the Midget, at least. What time do you call this, then? A lie in, was it? We've got work to do, have we not? We've got two shops to go to today, haven't we? Two shops and two things. A man who boasts like that - there's something wrong. GLORIA: We're going to the same shop, aren't we? DAVID: Lead the way, madam. but she seems content to let Angela and David lead the way. -Are we sharing this shop, then? -I think we are, aren't we? Is it first one in bags the bargains? GLORIA: Tell you what, there's another one down here. Ah, I see. Something up her sleeve, eh? Cunning. -And another name I don't have to remember! Angie? Oh, this makes my life much easier. So an awful lot of names and an awful lot of antiques too. All to yourselves, though, since Gloria craftily swerved elsewhere. This is rather interesting, cos this actually is a charity shop. -It's a charity shop that stocks a lot of antiques. Good morning. Lynn? The manager, I can see from your badge. -I'm Gloria and this is Paul, who's our expert. -I was just saying - I love the idea this is a charity shop. We rely heavily on donations. obviously to generate as much profit as we can. I wonder what Gloria and Paul can do to swell the charity's coffers. -May we have a look in the cabinet? There's a lovely little stick pin here. -And it's got its original box. -Charles Packer, Regent Street retailer of London. A little gentleman's stick pin. -Could that be a little sapphire? rather than the sapphire, I believe. And the price is £25. -I adore. What do you think? under no circumstances would I haggle in a charity shop. Not in a charity shop. Keep it in your hand or put it back in the case? I don't think we're going to risk snaffling our pin. Well played, you two. Any news from the other shop, though? -Lordy, what's she seen now? -And we have a pair. They're not in very good condition, though, that's the trouble. -She's missing the fan! Look, it's there. There's a lump on the top where there should be one of those. I know, but be forgiving, Angela. Proving a bit of a hard sell, eh, David? -They're not doing it for me. and you're thinking, "Wow, there's a pair of beauties over there." The closer you get to them, it all goes terribly wrong. these are the kind of things that people fall for. Why should we foist them on someone? WHISPERING: Because that's what we do. That's our job. Oh, dear. It's not a consumer show, Angela. while I think about it? -I think I know what that means. Meanwhile, Paul and Gloria have got something else in mind. Hmm, erm, quite like it. -It's this whole cupcake thing. -Ladies sitting down to tea. You've got a typical folding three-stage affair, yeah? And would these be hand painted? This is why I'm drawn to it. but look at the decoration here. character marks, the artist has actually signed it. -It's going to date to 1920, 1930 in Japan. is an extremely uncommon object. -Actually, I would serve you tea on that, Paul. -A few fairy cakes on that, absolutely, yes. Will I hide it just in case Angela and David come in? I never even thought of that. Absolutely, do. That's got David Harper written all over it, by the way. but right now he's considering a much more youthful item. -It's a wine rack, isn't it? -I've got shoes older than that! -All right, it was made yesterday. -If you're interested in that, that's actually mine. -When did you make it? Cheeky! Let's get it out of the window, shall we? First of all, Angela, do you like it? Um, in a conservatory, it would look good. -It needs a good clean. -You could varnish the top, couldn't you? I think our next stop has got to be to a supermarket. we're going to have the cleanest antiques ever this time. -I'd be happy at 30. I'd be delighted at 30. Do you think Angie will be at 30? -Angie's going to absolutely snap our hands off. She's going to have such a good day, she's going to lock up and go home. They're having a very nice time - quite the double act, in fact. -Thanks very much indeed, Angie. Great pleasure. Thank you, nice to see you. Down the street, Gloria could be about to turn over a new leaf. but I love this lectern. but there's a recipe book here. if you had a big enough kitchen. -I'd love the kitchen big enough for this! Look at the base of it, look. -Strange structure. It's almost like a rocket. it's in a blondish oak. If it were desperately dark, I'd maybe have an issue with that. It's actually on a sale price here - was 125. -It's now 70, which is a real good sale reduction. -How do you think we would do with that at auction? I could estimate that north of £80. It's going to be the only one in auction. -So can we have it? I think we must have it! So with no haggling required, those three items will cost £120. Meanwhile, the others are enjoying life back on the road. and Angela, of course, was on that motoring programme. you can imagine in between, including 1910 vintage cars. Have they had you on Top Gear? -likes admitting that I was actually the first presenter! to the village of Brasted. -How about that, then, David? And an even shorter walk. -How do you do? I'm Hugh. My gosh, this is a real antiques shop. Yes, there are several fine things to be found in here. Everywhere you look! Look at that mirror. and perhaps better quality than they've purchased so far. -That is a fab, fab table. They have money to spend as well, close to £300. -What do you think of its shape and design. -It's a good shape. What do you think? How heavy is it? Can I have a feel? Yeah. It's off-centre in the middle. Oh, it is very wonky-wonky. -How much do you think at auction? -They want 88 for it. Gloria and Paul are shopping around. You know, I am very systematic. -and we're going to have a wee mooch. it should all be in order. Paul, I found something to keep you in check. I might just keep this by my side. now that they've got a few things in the old bag. but today I feel happy, cos we've found something we like. Even better is that Gloria's now doing more of the finding. I must say, Wendy, I absolutely love this sewing box. -Look at it - it's in beautiful condition. Just imagine all the threads and everything in there. Paul, what do you think of this? I've fallen in love with this sowing box. I walked past this previously. It's very me, I adore it. I shouldn't say that before we start! Have you seen the condition of it? Look. It's not sat in front of a window. -The ticket price is 245.
we haven't got that much money left to play with. -if you'd like me to tell you? I'd say that's worth 250. -At 250, we would make a little profit on that. Could we take chance, do you think? Looking at your face, I think you're up for a bit of a punt, are you not? You know you've got a sale here, don't you? Do me one last favour. Go and ask and say, "They really want it, but it's 170." That's not a big ask, another tenner. I should say no, but I'll try. Are you smiling, Wendy, widely? How about we shake Wendy's hand? -You're a smoother talker, Wendy. Come here, you. Come here a minute. -I've got to give you a kiss for that one. -But you discovered it, Gloria. Anyway, now Angela's finally found a bit of quality. It's marked on the bottom, silver. let me find the hallmarks on this thing. Here we are, up here. Look at how crisp they are! -We've got a mark for Sheffield. The lion passant and then the T for 1934. -So that is kind of mid-period Art Deco, isn't it? -It's not a glass, what do you call it? Is it a flute, I don't know! I don't know, it's for drinking champagne. The ticket price is £85, but they can certainly afford it. We could make a bit of money on it or we might lose heavily on it. how nice to think that we made that possible for them. Everybody, surely, must own a Mappin & Webb solid silver champagne coupe. I don't think they do. I think they're reasonably rare. They're very common, aren't they, Angela? All over the place, darling. -What kind of money can we do that for? -Can we make it a nice...? I like noughts. -What are you thinking, 60? -That was a quick answer! That's right, but I tell you what, we'll do 70 for you. 70. Do you pay £70 for a solid-silver Mappin & Webb champagne coupe? -It's very you, Angela Rippon. I think we're going to have to have it, aren't we? -Can we take it that it's sold? -That means there's £10 coming back to me. Thank you. A bit of a pause there, I didn't like it. So their shopping's now complete. storming towards the ramparts of Leeds Castle? Is this our lucky day, or what? Oh, my goodness, talk about a feel-good factor. The shopping's done too, and they're ready to explore. The stonework on the castle looks really clean, doesn't it? -Could be a movie set. despite its somewhat confusing name, for over 900 years. -The castle looks magnificent on this gorgeous day. since the medieval Queen Eleanor of Castile. Here we are in the beautiful courtyard. -I suppose you're wondering why it's called Leeds Castle. and not after the Leeds in Yorkshire. and then passed in the 12th century into royal ownership. How many kings would have lived here over the years? Gosh, I would have to use quite a lot of fingers to count that up. and that takes us right up to Henry VIII. for a meeting with the French king in Calais. and one of those was Henry's next wife, Anne Boleyn. but appearances can be a bit deceptive. It says this particular fireplace was installed in Henry VIII's time. tiny little castle motif, which is very sweet, and Tudor rose. and did a wholesale renovation of the place. and set about creating her own version of history. adding several 20th-century comforts including up-to-date plumbing. -No planning consent, I suspect! All these beams would be from late 1920s? so it's all very, very practical. as well as preserving the treasures of previous rulers. two of Henry VIII's wives. We have here a missal said to belong to Catherine of Aragon. Now, what exactly is a missal? and sermons for the religious year. and you can see the stamped portraits of the saints there. albeit rather damaged, frontispiece there. -This book dates to 1527. It is, it's very crisp. Apart from the edges, the actual text is very crisp. and of course she was the second wife of Henry VIII. Slightly less fortunate, I think, than his first wife. for carrying a very small version of the missal that we've just seen. used to tie ribbon so that you would carry it around on your waist. It's a wooden construction and has been upholstered in brown velvet. It has these iron bindings, which at some later point have been gilded. So originally it would have been a lot plainer than you see today. We could have done with that box to take to our auction, couldn't we? Yes, I think it's not for sale. The thing is, they do do B&B here, so you can check in. -and good luck with the auction. house room in a castle, but let's have a butcher's anyway. -As long as I don't break anything that's on it. Well, I see there's a towel rail, rather different. Table, which will take... Is it 10 or 12 bottles of wine underneath? -And classic... Why are you laughing? -What are you laughing at?! -And classic G Plan furniture. -I'm not mad on that. -Tell me what you paid for this? - 50. - You were robbed. Sorry, was that German he was speaking? It is the piece, this is our favourite piece, isn't it? GLORIA: This is beautiful, I love that. That is Mappin & Webb, 1934, solid-silver champagne coupe. That's a champagne coupe? The decadence of it! - I thought it was Holy Communion! - With champagne? But that's our favourite piece, I think we agree. -In fairness, it's not got a lot of competition. Well, come on, then, shall we be as impressed? Yeah, follow that, you two, I'm sure Angela and David won't hold back. Got a Victorian lady's sewing table. but it'll never sell for that at auction. What did we say? We thought it might sell for about £50. and forgot to take the mug back. It just shows how little you know about Scottish pottery. -I actually don't, is it Wemyss? The cat makers? Give me a Wemyss cat any day! Actually, it's got beautiful hand-painting on it. -I think that's got something going on there. And the converted birdbath or something? It's a bird house, not a birdbath. and put it out in the garden. It would look lovely in my garden. -Oh, how little you know, Miss Rippon. -You've stood at many of those. -I've stood at many in my life, none quite like that. -So what's in the little box? -A little Victorian stick pin. "Made by Charles Packer and Co, Regent Street." Run through some figures then, so, 40 on the table. The auction's going to be a riot. It's going to be out of this world. -It's going to be brill. We hardly need to inquire what they really thought after that lot. Seriously, the two tables, many an auctioneer would just reject them. "We don't do that, there's a charity shop nearby that does!" because everything we've got is very saleable. And that's the line I'm sticking to. -Nothing you'd swap, is there? -I think we'll do all right, I really do. And so have you. Good team! Nothing left to chance, though. Let's see if this is going to work, I hope it is. -Look, that muck's coming off there. -Look at you, you're a domestic goddess, you really are. -What shall I do, the towel rail? -You have a go at that. A few minutes of preparation make all the difference to a sale. Going to lend us a hand, darling? No. Oh, look, it's coming up terrific. We've got all the kit, haven't we? We could top-to-toe a house. There's a show - Clean The Nation With Angela Rippon. for an auction in Chiswick. but I think this time I'm going to get the better of you. I think they might be taking this a bit too seriously. And there are the boys. Hi! -How are you doing, Gloria? -Are you not even mobile today? -Lovely to see you. Are we raring to go? I think we are, I'm feeling quite confident. We're going to win, so there we go. so hopefully almost all our purchases will fit right in. I wonder what auctioneer Matt Caddick rates most highly. antique and a very clean example, so that should do OK. The Poole Pottery - this is a pretty boring pattern, in my opinion. Transfer decorated. Even to achieve the estimate, it might struggle. and the cake stand as to what's going to make the least money. Practically and decoratively they're just both a bit lacklustre. while Gloria and Paul spent £333 on their five lots. -Ooh, I say, posh seats as well. -Could you not have got us a better seat, Angela? -I don't think so, dear. -We needed your influence, Gloria. -Too posh for us, I think! Yeah, you're lucky they let you in. And they're lucky they let their nest of tables in. and if I was allowed to bid I would buy them. Hang on, I'm confused - what tactic is Gloria playing? I'm not allowed to buy today, otherwise I would buy them. She's got her competitive face on. -And is there £50 to start me? -Nest of tables at £50, start me. -£40. Shall we start at 20 and see where we go? -Blood from a stone, at £20 I'm bid. I can't ask any more times. -Give it another five minutes! -So much for that plan. -Obviously in London they have no style. I think someone paid £20 too much for them, frankly! Next it's Gloria and Paul's wee Scottish pot. We paid 38 quid for it and they've only put it down at 15 to 20! Start me at £10, £10 for the Wemyss? I'll let you catch me up, start me. £10 I'm bid, we're off at 10, and 12 I'll take. You do know that the Queen Mum collects this pottery? She's not here today, though. 12, you've done enough, £12 I'm bid. -Oh, that's got it away. -It's worth more than that, come on. Well, you just doubled the value, I can't believe it. Chiswick seemed less than impressed, I'd say. I just think £20 for a tooth mug is over the top. - Well, it is. - A very nice tooth mug though. It depends on your teeth, you see. Your teeth would have looked good in that mug. For ginger, or anything you fancy, really. Moderately estimated, start me at £20 for it. The Poole Pottery, £20 for it. I think it was collected by the King of Siam. King of Siam collected this, there you go. £10 for it, give me £10, start me at 10. You're going to make me really work - £5 for it. -I'm going to go up in ones now. £5, and 6 I'll take. We're going to sell it, all done, for five. Oh, I am so sorry about that. The auctioneer had that one right. -Now up comes the absolutely delicious lectern. Sorry, I did get that wrong. -I'm going to strangle both of you on the spot. -I think she means it. -Well, at least this thing's antique. It's going in the wrong direction, Gloria. -It is, I'm very disappointed. Now you're being really mean. -Now I'm bid... You've got a tenner. Cheaper than lumpwood for your fire at £10. Start me at 12 now. At £12... In the room then at £12, I can't believe it. We'll sell it at £12, shall we? £12. - No! - Excellent news. Not quite free speech for some lucky lecturer - huh! - but close. When I arrived here today I loved you. Now I'm beginning to think you're really mean at heart. -You're getting to the real me, Gloria, yeah. £10, start me. For the towel rail at £10. At £20, in the red chair at 20, is there any more now? If you knew how much time... She's been at it! it's worth every penny of whatever you're prepared to pay for it. -Oh, that's more like it. -In the red chair at 24. -If only it was left original. Are we done and out, then? 24, it's stylish enough and goes. Oh, well done, fabulous. First profit, yeah. but then, Angela and David did only spend half their cash. Now for Gloria and Paul's precious yellow metal pin. Start me at £20 for it. £20 for it. £20, the lady's bid at 20. Shake of the head. £24 then, still in the stripes. We're going to sell it... £24. -A Regent Street pin for a very good price. Who'd like a shiny wine table of dubious vintage? -You've got some stiff competition, I'm bid already at £10. 12 I'll take. For this wine table, then, at £10. -It's very nice. I cleaned it. I cleaned it! For £10... No-one drinks any more, it's a sad age, I know, it's crazy. No-one else going to come in? We've got to sell it. £10. Will Gloria and Paul's cake stand fare any better? He's not liking it. Telling the truth. -I could clean it for you. - Oh, no, here we go. - No, excuse me. It is signed, specially signed. Got Japanese decoration on and it does fold flat. Yeah, that's the way it goes. See? I did mean to bring cakes for you all to eat and I forgot. I'm so sorry. Oh, that would have been lovely. So, the much-talked-about signed cake stand. Start me £30 for it. £30 for it. Vintage tea parties are all the rage. £20 for it. On the internet? Good heavens above. A maiden bid from the World wide Web. -All done and out. 30. Another profit. Good work, team. Time for Angela's champagne moment. -This is our big, big spend. it'll bring real pleasure to their lives, I think. -That will make me happy. -It will. It'll make me happy. -It may not make a profit but it'll make us happy. We'll be happy because you're happy. -If only she meant it. -What's it worth? Is it worth £30? It's worth at least £30. At £30. 32 I'll take. - ..40. 2. - Excuse me. - £45 in the doorway. - It's worth a bit more. -Are we done, then? For £45. All out at £45. All done. And it sells. -48 online. That's more like it. -No, don't shake your head. The internet's come in at £48. We're done. The sewing table will decide it. load of money on Victorian brown furniture. -Yeah, about 15 years ago. -..would've done REALLY, really well. They're not the price they used to be. A bid at £90 to help me on the book. One, two, three bids. And I'll take 100 in the room now. On the book at £90. Is that it? It's such a shame, isn't it? At £90. -They don't make old money at 90. Going to sell at 90. All done. Oh, it always was a tad optimistic. Oh, and they're supposed to be friends! if they'd actually made some money. after paying auction costs, a slightly smaller loss of £97.26. -..that was... That was hot. -It was hot but it was GREAT! It was good fun, wasn't it? It was great fun. I really have enjoyed it. - And I love Paul. - Aw! -How much do you think you'd get for him, then? I seriously thought of putting him up for auction. -Cos the make-up girl was at him all the time. I don't know how we can have so much fun by losing so much money. - So deal us the figures, then. - OK, here we go. The B team, over here, have lost almost £200. - Well done. - Hey! -And we have actually won by losing almost £100! THEY CHEER GLORIA: Very good. -I'm going to recommend you two to everybody. Really? You can't hire us out, you know. -But what are you going to recommend them for? I'm going to have a new programme called Who Was The Best Loser?. We'd be good at that. We're going to celebrate now. -GLORIA: I've got an idea, actually. Why don't we just do the programme again and again, until we win. You'd be welcome back any time. A battle of legendary presenters plays out around Kent and Sussex as Gloria Hunniford and Angela Rippon join the road trip. Along the way they stage a rescue mission to help stranded experts Paul Laidlaw and David Harper. Gloria hears the story behind a local landmark and Angela steps into the world of Virginia Woolf.